This week I turn my attention to the oldest film yet reviewed. 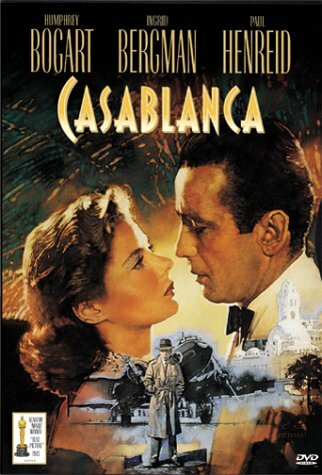 I admit it diverts in style from most, but Casablanca is almost universally considered a classic, and I share any classic I first watch here. While the romance again receives a great deal of attention, the World War II backdrop is rich and contributes significantly to the plot, I am told. Shortly before the United States joined World War II, American Rick Blaine (Humphrey Bogart) runs a cafè in Casablanca, a neutral Vichy French colony. Rick is as neutral as the town he serves, where all nationalities on either side of the war mix, and refugees from Europe try to escape to the U.S. Two such refugees are Victor Laszlo, a hero of the Free France movement, and his wife Ilsa, whom Rick had fallen in love with years ago, and who abandoned him without warning, making him bitter and disconnected from the world. In possession of the visas they need, Rick has to confront his past and take a side. Mark Twain once said that “a classic is a book which everyone wants to have read, but nobody wants to read.” I admit I was put off by the age of the film, and the romance plot, but one usually doesn’t want to revisit such “classics.” Whether or not that is true of Twain’s statement, Casablanca is a film I would watch again. It’s a sophisticated, intelligent, complicated story of a world about to change. There’s nothing I can say about the leads’ performances that hasn’t been said by dozens of critics far better than I could. Bogart proves he can be a romantic lead, Ingrid Bergman is a 40s Hollywood woman (they all run together for me), and Paul Henried is not present so much as he’s talked about. Captain Renault is a Frenchman played by an Englishman who puts as much work into his French accent as Patrick Stewart. The film has been very well-preserved and/or enhanced. The high-definition copy I watched was as clean as any modern movie, and the globe at the beginning is so smooth and well-defined I can’t tell if it’s a model or a CG reconstruction. That said, the story needs high definition as much as it needs color. If you really want it, you can have it, but it doesn’t add or subtract anything. Watch this movie:As a historical fascination, a work of art, or a great story. Almost anyone will find something to love about it. Don’t watch this movie: if you’re a Nazi, I guess. That’s not an attack, just an observation.